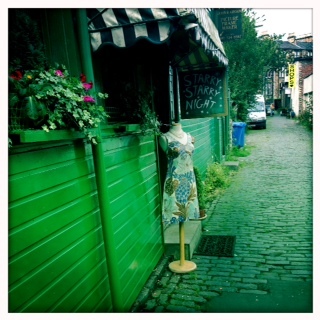 Our vintage shop adventures begin in Vintage Guru on Byres Road. And we’re in luck because they’re having a fantastic sale including a £5 and £7 bargain rail. But good finds wait for no one so don’t delay – amazing patterned swimming costumes, exquisite hats and dresses for every occasion and price range await you. Next stop is Starry Starry Night on Dowanside Lane. 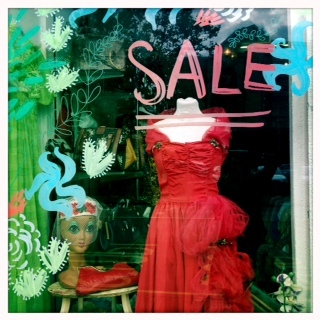 But this is not a merely a vintage shop, it’s an experience. Tucked away down the cobbled lane this glamorous retreat offers beautiful elegant clothes draped around the shop, hanging from every available surface. There’s anything and everything including hatboxes and a rail of furs. And I’m quite sure I’ve found the way to Narnia. From there we visit De Courcy Arcade , the perfect collection of vintage shops all in one spot, including the Audrey Hepburnesque Just for You – overflowing with gorgeous dresses and my favourite shop -Miss Lottie Lou. And there actually is a super-talented Miss Lottie Lou in this magical wee shop, working away on her sewing machine to create made-to-measure vintage masterpieces. The selection of material and vintage sewing patterns to choose from is nothing short of impressive. Admittedly the thought of clothes that actually fit perfectly is blissful – even better, Miss LL works within your budget. I could spend hours in this tiny shop looking through the jewellery, dresses and delightful trinkets and lace handkerchiefs still in mint condition in their original boxes. As I walk back home from my shopping expedition, high on vintage – I somehow manage to rip my favourite skirt. But I don’t get upset. I get inspired and excited. 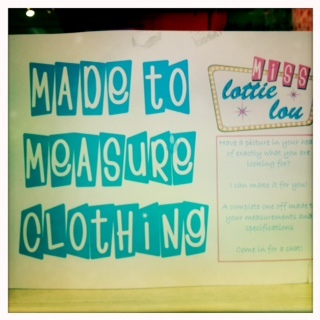 Miss Lottie Lou are you ready to whip me up the perfect new skirt because here I come!